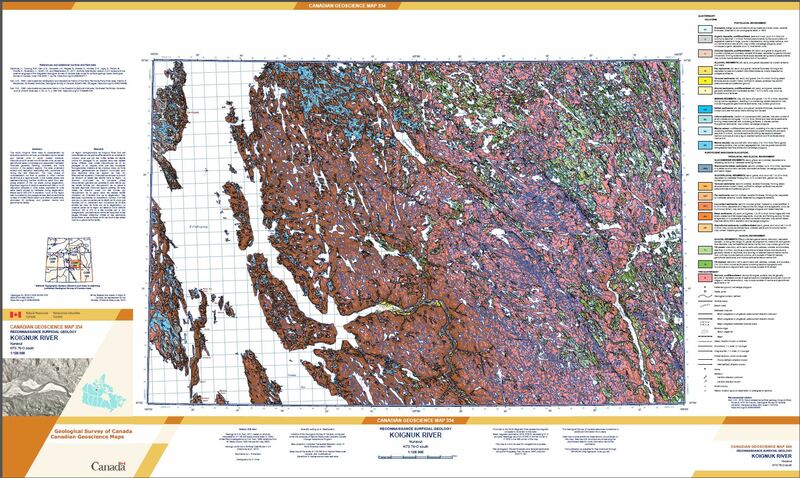 The south Koignuk River area is characterized by extensive bedrock outcrops, and isolated marine veneer and blanket units in some coastal lowlands. Discontinuous till veneer and till blanket units, as well as glaciofluvial esker complexes and associated meltwater channels generally trending northwest, are more common in the eastern regions. The area underwent erosion and deposition associated with Laurentide Ice during the late Wisconsin. The main phase of northwestward ice flow is parallel to other ice-flow landforms at a regional scale. In the coastal areas, rare westward-trending ice-flow landforms result from late-phase ablation of the ice sheet during deglaciation. Significant regions of bedrock experienced little or no till deposition whereas in other areas, deposited till units were clearly eroded by meltwater during deglaciation. Below about 200-210 m elevation, much of the region was inundated by the postglacial sea. Marine sediments consist of limited littoral beach and offshore sediments, winnowed till surfaces, and isolated marine and glaciomarine deltas. The map identifies surficial materials and associated landforms left by the retreat of the last glaciers. The surficial geology is based on aerial photograph interpretation and limited legacy field work. This work provides new geological knowledge and improves our understanding of the distribution, nature and glacial history of surficial materials. It contributes to resource assessments and effective land use management.